Text MNDNR VOLUNTEER to 468311 to subscribe to text updates. What do DNR Volunteers do? Click on the video above to find out! Download the 2018 DNR Volunteer Annual Report for a listing of all the different kinds of projects volunteers do throughout the state. Since creating a department-wide DNR Volunteer Program in 1988, citizens have engaged in more than 11.3 million hours of volunteer service focused on managing our state's natural resources. Ambassadors need to be able to walk ½ mile downhill to the trail location on the boardwalk. Directions to Nerstrand Big Woods State Park: Take I-35 to State Highway 19 east into Northfield. Go south on State Highway 3, east on State Highway 246, then turn right onto County Road 29. Help bluebirds raise their young and share the experience with visitors! In the 1970s the Eastern bluebird population was so low that many Americans had never seen a bluebird. 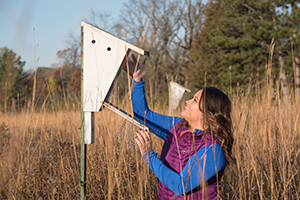 Thanks to the swift action and dedicated efforts of thousands of people across the country, these cavity nesters are now regular characters in open fields in much of the United States. The bluebirds recovered in large part due to the many thousand bluebird houses that people put up and monitored regularly. Without checking on the bluebird babies, there are a number of issues that can cause the chicks to die. Research suggests the birds still need our help to maintain their population, so you have a chance to continue helping bluebirds! In addition to being rewarding work, it's also a ton of fun! Bluebird Nest Monitors open the nesting boxes and record data on nests, eggs, and birds. Bluebird Station Volunteers connect park visitors with the bluebird project by running a Bluebird Observation Station, complete with binoculars and bluebird props. William O'Brien has over 160 bluebird houses that have successfully raised bluebirds, tree swallows, house wrens, and other native species for decades. Last year we didn't have enough volunteers to monitor all of the boxes, so please help if you can! Volunteers help out as much as 2 hours every week to just 5 hours spread throughout the spring and summer. 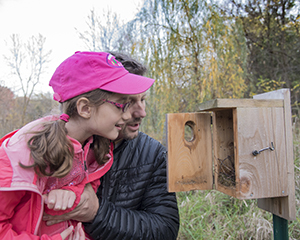 Bluebird Nest Monitors open nest boxes between April 1 and September 1. Bluebird Station Volunteers work the Bluebird Observation Station between May 1 and August 15. You can help with one or both parts of the program. Days of the week are flexible. Come to a Bluebird Program Information Session on Saturday, March 16, 2019 from 11a.m.-noon. Please arrive at the Visitor Center before 11 a.m. All vehicles must have a $7 daily or $35 annual MN State Parks Sticker. Register by contacting Park Naturalist Sean Hoppes at 651-433-0500 x227 or [email protected]. Please don't hesitate to call or email with questions or if you can't make the information session and you'd still like to volunteer. All volunteers will be required to attend the Bluebird Program Orientation on Saturday, March 30, 2019 at the William O'Brien State Park Visitor Center. Bluebird Nest Monitors will meet from 10:00 a.m. – noon. Bluebird Station Volunteers will meet from 12:45-1:45 p.m. Please attend both if you decide to help with both aspects of the program. Thank you for becoming a volunteer and helping bluebirds and park visitors! Support Minnesota state forests and preventing the spread of invasive species by staffing the booth at the Outdoor Adventure Expo at Midwest Mountaineering, 309 Cedar Ave. South, Minneapolis, April 26-28, 2019. Help educate attendees about the great opportunities to recreate responsibly on Minnesota's state forest lands. Teach recreationists the simple steps in preventing the spread of terrestrial invasive species. Arrive for your assigned shift on time; shifts are 3 hours. Help set up the booth if you come on Friday. Talk to show visitors about the importance of stopping the spread of invasive species and action steps folks can take to help protect our natural resources. Pass out boot brushes and handouts as needed. Help take down the booth if there at the end of the day on Sunday. Be familiar with the negative impacts of garlic mustard, common tansy, spotted knapweed, and other terrestrial invasive species. Volunteers will receive a free tee-shirt, ball cap and tote bag for helping! For questions contact Forest Eidbo, PlayCleanGo Outreach Coordinator, St Paul, MN at 651-259-5259 or email [email protected] for more information. 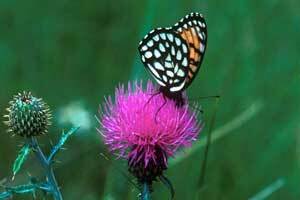 Use your artistic skills and take this opportunity to make help a difference in documenting the wildflowers, bees, moths and butterflies currently present in the area of St Croix State Park. Your photos will assist us in determining if the pollinators in Minnesota are stable, declining, are vulnerable to decline or are below levels desirable to ensure their long-term health and stability. Minnesota has a stewardship responsibility for those species of which populations in the state represent a significant portion of their North American breeding, migrating, or wintering population, or species whose Minnesota populations are stable, but whose populations outside of Minnesota have declined or are declining in a substantial part of their range. Portions of St. Croix State Park are currently being restored to a native oak savanna biological community. This community will provide habitat for pollinators, flowering forbs, and other savanna species. No minimum time commitment is required - whatever time and photos that can be taken (April – October) are appreciated. For more information contact Anna Hess, Eastern District Manager, Nongame Wildlife, Duluth at [email protected] or 218-302-3243. Attention: Aspiring and experienced woodworkers! Help classroom teachers across Minnesota teach children how trees and other woody plants grow, factors that affect tree growth, and tree identification. Teachers love having sets of cookies like these in their classrooms but don’t have time or tools to make them. We need volunteers to create "tree cookies" -- slices of branches or trunks that show the rings of a tree. 100 cookies supplies three classes of students, so the more you can make, the better. They will be used! Using branches or trunks that are between 3 to 6 inches in diameter, slice into ½-inch thick, wafer-shaped "cookies." Wood having with easily readable rings are preferred. Ash wood not accepted. Dry the cookies correctly. Do not skip this step or your cookies will rot! See detailed instructions. Sand the surfaces until the rings appear. Finish the surfaces with clear varnish. Optional – Label the cookie with the tree species and location cut. You must provide your own tree or woody plant material, saws, sander, oven, varnish, and labor. This project can be done individually or with a group (scouts, 4-H, FFA, Kiwanis, etc.). 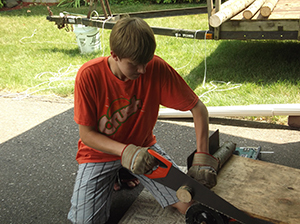 Eagle Scouts may be required to make larger quantities. When finished contact Laura Duffey, 651-259-5263, [email protected] to arrange for delivery and to get Minnesota DNR recognition. Do you think bees and butterflies are important to our environment? Have some gardening skills? 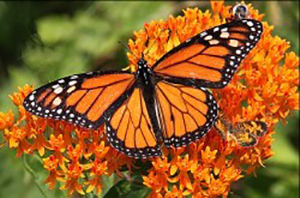 Share your knowledge about the importance of protecting pollinator habitat and assist with maintaining the butterfly/pollinator gardens at Whitewater State Park this spring and/or summer. Invasive species identification and removal as instructed. Carry up to 30 pounds. Walk up hills and on uneven terrain. Reach overhead, bend over, and squat/kneel down without restriction. Fill out the Prairie Butterfly Garden Volunteer Application online to get started! You will be contacted with more information. Whitewater State Park is near Altura, MN. It’s thrilling to watch bison up close! Visitors entering the bison range at Minneopa State Park near Mankato are anxious and excited for an opportunity to see and photograph wildlife. Yet, many visitors may not know where or how to watch bison safely and courteously. Park staff cannot always be present to provide directions and answer basic questions about bison and bison viewing. For this reason Bison Ambassadors help establish a link between visitors and park staff. Be a Bison Ambassador for 2 hours on weekends or holidays! 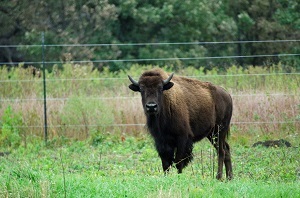 Become familiar with basic bison safe viewing information and communicate this to visitors. Help the public view bison at Minneopa State Park by answering visitor questions about viewing etiquette and locations bison where may be seen. Answer questions and explain bison drive rules in a cheerful and helpful manner. Act professionally in your official role as a Bison Ambassador. Refer all questions related to DNR policies and procedures to your supervisor or the DNR Information Line. Make at least one entry into the Ambassador Log Book for your shift. Entries could include frequently asked questions, notes on where the bison were, interesting nature observations, visitor behaviors of note, or anything you feel would be of value to share. Occasionally assist with the naturalist program by posting and distributing schedules, publicizing programs or helping with programs. You must never come within 25 yards (75 feet or 1/4 of a football field) of bison. Do not come within 75 feet of a cow and calf. Never drive a vehicle around or through a herd of bison. Avoid expressing personal opinions while on duty and representing the park as a Bison Ambassador. Be familiar with Minneopa State Park rules and safe bison viewing. Shifts are 2 hours long. 10:00 AM – 12 Noon or 12:00 – 2:00 PM. We prefer you not volunteer for both shifts on a day to avoid fatigue. To sign up go to the Bison Ambassador Application to sign up as a DNR volunteer and then view available shifts. Want to use your knowledge and passion for outdoor recreation to help others find opportunities outdoors? 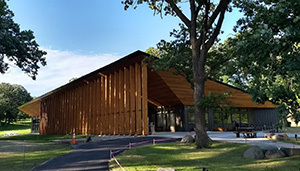 The Minnesota DNR Division of Parks and Trails is partnering with the Loppet Foundation at The Trailhead, a new and exciting outdoor recreation facility located in Theodore Wirth Regional Park, 1221 Theodore Wirth Parkway, Golden Valley MN, 55422. 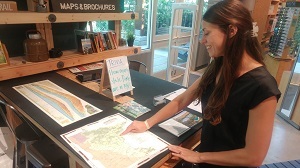 The MN DNR Division of Parks and Trails has a kiosk in the new building to provide resources on outdoor recreation opportunities and is looking for volunteers to staff it. Be a part of a new partnership that will continue to encourage getting outside and enjoying Minnesota’s public lands! For more information on becoming part of the Trailhead Team, please contact Kaia Bierman, Conservation Corps Urban Outreach Specialist, at [email protected] or via phone at 612-725-2724 Ext. 222. The Minnesota DNR wants your knowledge and passion for outdoor recreation! Interested in sharing your love for Minnesota’s State Parks and Trails with others? 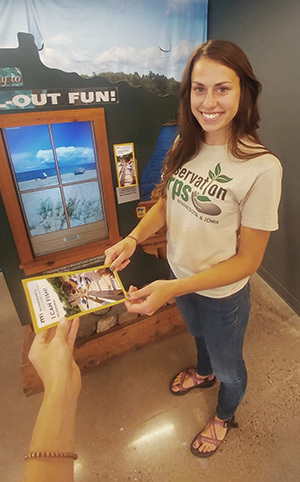 The Minnesota DNR Division of Parks and Trails is looking for volunteers to staff the new Adventure Station located at the REI Bloomington Flagship store. The Adventure Station was created in an effort to provide awareness of recreational opportunities and to connect people with outdoor experiences on Minnesota’s public lands. For more information on becoming part of the Adventure Station Team, please contact Kaia Bierman, Conservation Corps Urban Outreach Specialist, at [email protected] or via phone at 612-725-2724 Ext. 222. 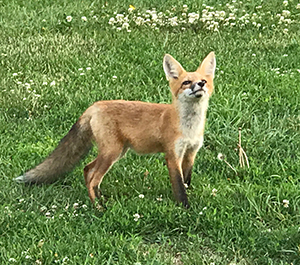 The State of Minnesota has over 1,000 public wildlife areas designated for wildlife watching opportunities of birds, waterfowl and mammals, as well as offering public hunting of small and big game animals. These Wildlife Management Areas (WMAs) need help in maintaining and enhancing the land so wildlife can thrive. Individuals or groups interested in volunteering to help wildlife can do a one-time event or come back several times. To volunteer on a Wildlife Management Areas (WMA) in Stearns, Wright or Sherburne County, contact MN DNR Assistant Area Wildlife Manager Nicholas Snavely based out of Sauk Rapids at 320-223-7872 or email [email protected] for scheduling specific days to volunteer. 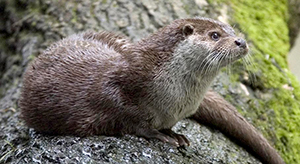 Use your organizational and computer skills to help the Aitkin area Wildlife Lake Specialist scan numerous wildlife lake and wild rice harvester paper surveys and save them electronically for long term preservation. Scan all the wild rice harvester surveys individually so they can be stored as individual records. Scan multiple pages of individual wildlife lake surveys so all the pages can be filed and stored as one individual survey. Hours can be flexible based on the volunteer’s schedule, but must occur between the hours of 8:00 AM – 4:30 PM Monday through Friday in the DNR wildlife office at 1200 Minnesota Avenue South, Aitkin, MN 56401. If you enjoy the great outdoors, scenic vistas, and the company of other campers, then consider volunteering to be a "live in" host for at least 4 weeks (one month) during the period of April to October at a Minnesota State Park operated campground. Hosts may be requested to assist in the naturalist program by posting and distributing schedules, publicizing programs or helping with programs. Volunteers will set an example by being model campers, practicing good housekeeping at all times in and around the host site, and by observing all rules. 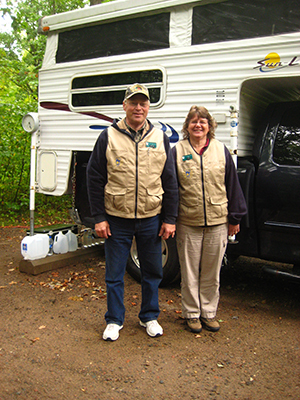 Campground Host volunteers generally work independently. Volunteers are accountable to the park manager who will provide training and orientation for hosts and assist hosts throughout the season with any question or problems that may arise. Length of period, workdays and hours are established with the campground manager, but will generally include all weekends and holidays. Avid campers or RV’ers are encouraged to apply! Read more about the Campground Host Program. Check out the 2019 Campground Host Locations. Email your questions to [email protected] or call 888- MINNDNR (888-646-6367) or in the Metro area call 651-259-5607. NOTE: Campground Hosts will be selected from applications that have been satisfactorily completed and submitted in a timely manner. Interviews will be conducted by the campground manager. The number of consecutive years that a host may serve may be limited to allow others an opportunity. These limitations are at the discretion of the campground manager. All DNR volunteers must undergo a background check. This is done at the time of selection. This also applies to hosts returning from the previous season. The Adopt-A-WMA Program was established to encourage sporting, outdoor, business, and civic groups or individuals to assist, on a volunteer basis, in improving and maintaining Wildlife Management Areas (WMA). This program encourages Minnesota volunteers to "adopt" a specific site, parking lot, or project on a WMA area to help maintain these public lands in cooperation with Assistant Area Wildlife Managers and Area Wildlife Managers. Projects for the Adopt-A-WMA Program are typically focused on a minimum 2 year time commitment. Volunteers must be able to work outdoors in various weather conditions safely without direct supervision except for initial guidance and orientation as needed. Hours are flexible typically Monday through Friday with weekends possible depending on the project. Trash pickup, sign replacement, vandalism reporting, reading water gauges, painting facilities, etc. Seed harvest, weed removal/vegetation management using hand tools, shallow lake and wetland water control vegetation clearing, wildlife surveys, facility work, fence removal, invasive species control, maintaining forest openings, etc. Those interested in serving as a hunt partner/mentor, assisting with hunt orientation or handling harvested game can check the list of accessible outdoor recreation organizations that sponsor special hunts each spring and fall of the year. 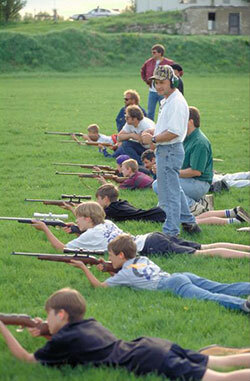 *This type of volunteering requires hunter education and safety certification. Equipment, power tools, chainsaw work, other specialized skilled work, mowing noxious weeds, mow prescribed fire breaks, mow hunter walking trails, prescribed burning, etc. Organizations or companies interested in improving wildlife habitat on a WMA may do so at Level 3 by providing contract services at no cost. This would include access/road maintenance, tractor and equipment operation, farming activities, mowing, power tool use, chainsaw work, prescribed burning, and herbicide application. *Liability and Worker’s Compensation is covered by the organization, rather than DNR, in these cases. To find the closest WMA to you, refer to the MN DNR’s Recreation Compass and maps of Assistant Area Wildlife Managers and Area Wildlife Managers. Contact them to find out how you can adopt a WMA! Projects are typically carried out on Saturdays from 10:00 AM to 2:00 PM, unless otherwise noted, on many weekends throughout the year. SNAs are the premier state lands displaying examples of native prairies, old growth forests, geological features and habitat for rare and endangered species. Take a look at volunteering on SNAs, and check out the calendar of events to see when you can come lend a hand! If you enjoy learning about nature, hiking, bird watching, or identifying wildflowers, you'll love being a Minnesota Master Naturalist Volunteer! 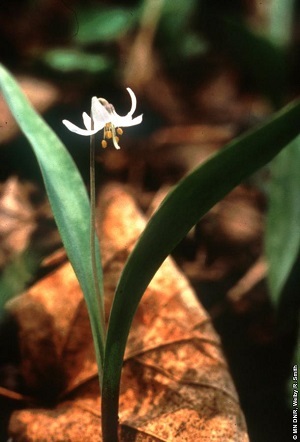 To learn more visit www.MinnesotaMasterNaturalist.org. Lake Level Minnesota volunteering... doing your level best! 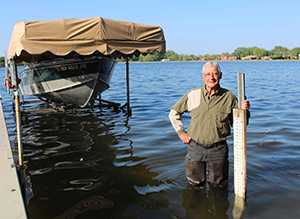 Whether it is floods, droughts, or just a normal year, lake level fluctuations (or the lack of them) are important to document. Be a volunteer observer and record lake levels on a regular basis. Pass on a love for your sport by teaching youth and adults the ethics and safety you would expect from those you meet in the field. All new instructor applicants and instructors seeking recertification must meet the requirements of being at least 18 years old and passing a Bureau of Criminal Apprehension (BCA) background check. If you are interested in becoming a DNR Certified Volunteer Safety Instructor, the process begins online: Get started now! And check out upcoming safety instructor courses. There is no fee to attend. Zebra mussels are spreading to lakes and rivers in the Midwest. Spend a few minutes checking the docks, swimming platforms, boats, motors, anchors, and any hard objects that have been in the lake or river where you live. Early detection for zebra mussels is important in protecting your property and Minnesota's water resources. 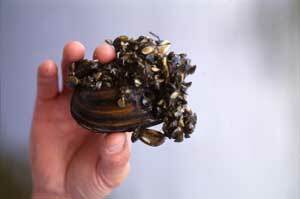 Learn more on how you can monitor for zebra mussels .